Last post for the day (maybe), then I am only a day behind - but I already have an idea about what to do. Anyway, a storm seems to be blowing in which is nice and hopefully gives us a cool break during this heatwave. 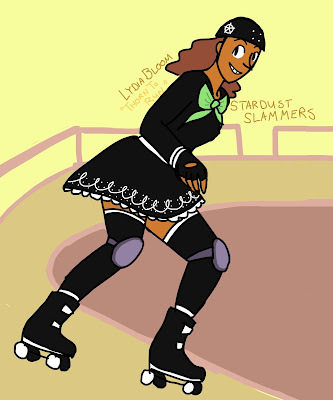 So, how about a Roller Derby magical girl? My Volenteer supervisor played roller derby - her partner would freak out with every injury, and us volenteers would wince and marvel while she recounted her teams exploits (as sometimes her injuries made it that we had to climb and lift things). Huh. Now that I think about it, with Guardians of the Galaxy 2 coming out, she will be going to the cinema a lot when it does. She is so cute! Love her smile! I hope the storm wasn't too bad! Love the energy and sense of 'can do' in this, love the fact you had an intellectual strong female supervisor that was in the roller derby too, nice to meet inspiring unique people in our lives!